Learn to make Pineapple Raita Recipe | Ananas Raita Recipe with the easy step-by-step video tutorial. 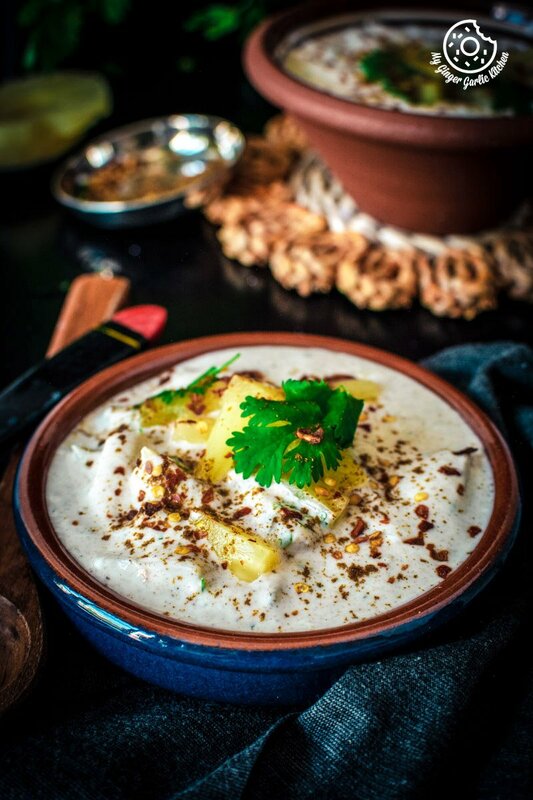 Pineapple raita aka ananas raita is a sweet, spicy and tangy raita bursting with juicy pineapples and seasoned with few spices and herbs. 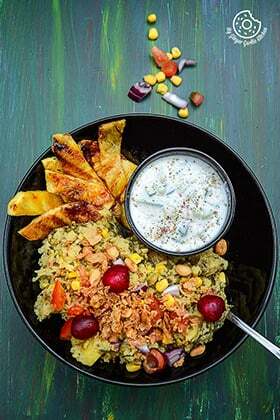 The sweet and savory flavor of this raita gives a surprising twist to the main course when served with spicy side dishes such as curries, dal, fried rice or stuffed paratha. There is so much to love about this exhilarating pineapple raita. Pineapple raita | Ananas Raita is refreshing fruit-based flavourful yogurt dish which is served as a side dish. 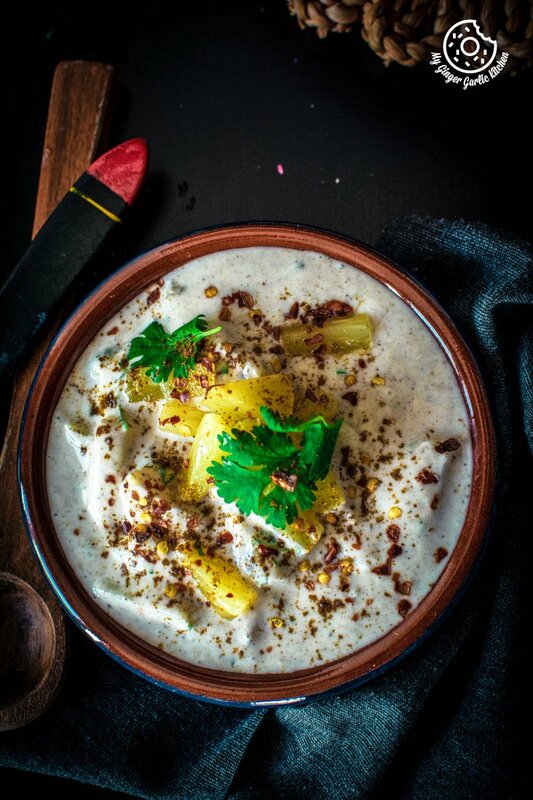 This raita has all the juicy tang and sweetness from the luscious pineapple chunks. And when you combine these chunks to the whisked yogurt along with herbs such as coriander, some additional sweeteners, and essential spices, then you get the most delicately and flavourful balanced side dish which has all the right kind of spiciness, sweetness, and tanginess. What can we serve with pineapple raita? You can serve stuffed flatbreads, Theplas, kebabs, fried rice, curries, or lentils. I also like to serve fruit raita as a dip for crackers. This pineapple raita also goes well with Biryanis and Pulav. They taste divine together. 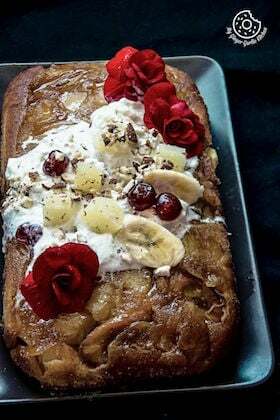 What is the correct way to serve Pineapple Raita/Ananas Raita? Pineapple raita is best served chilled. Chilling at least 30 minutes before serving raita is advisable, this way you would be able to conserve the freshness of pineapple raita. How long does it take to make pineapple raita? This easy, delicious, and creamy pineapple raita can be ready in a few minutes. It only requires a few minutes of chopping and mixing. 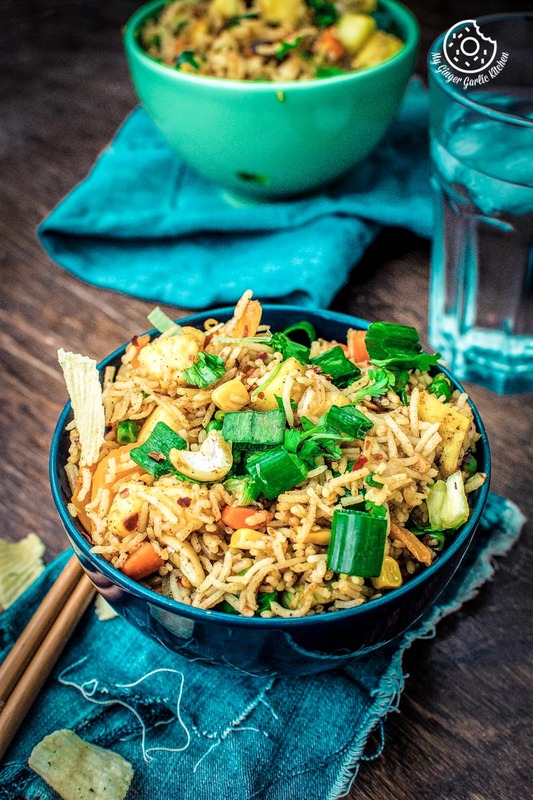 A single mixing bowl and a spatula is all you need to make this perfectly flavored side dish which can give that oomph factor to any of your meals. What is the real definition of Raita, in general? 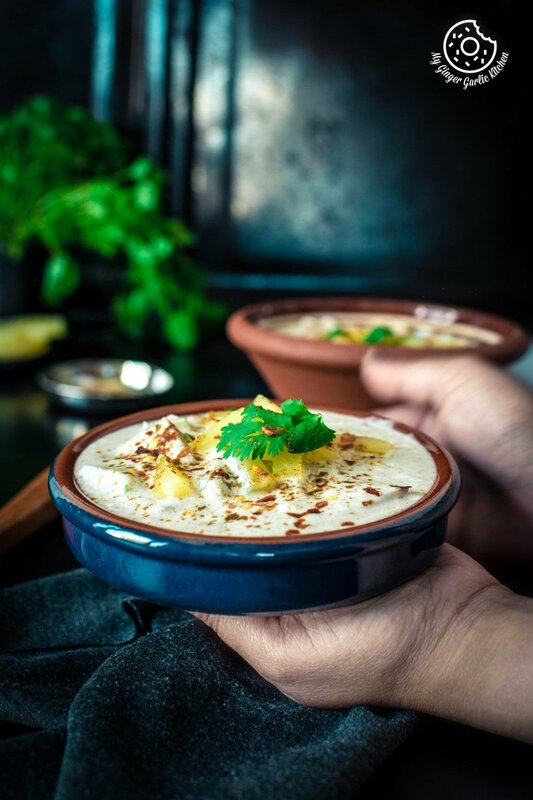 Raita is a yogurt-based Indian condiment or dip, which is usually served as a side dish with, dal, rice, curries, and flatbreads. 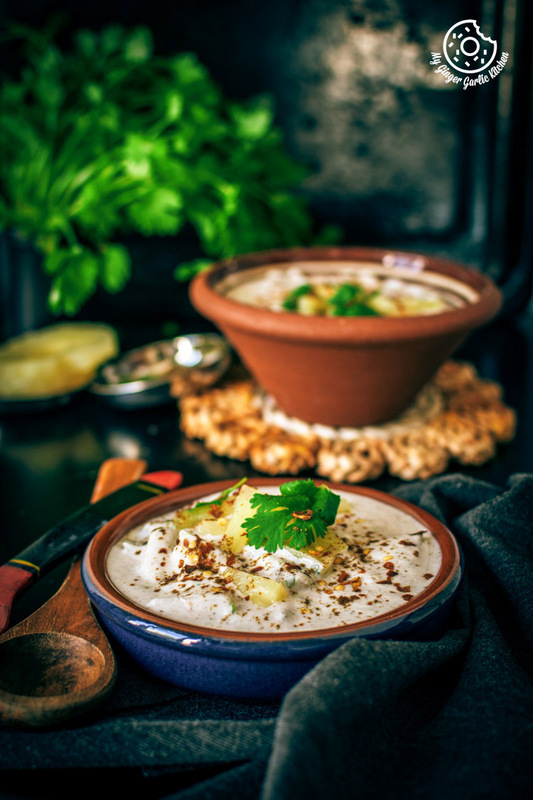 Raita is always made with dahi /yogurt which is often referred to as curd. Raita is either sweet or savory/spicy. How many types of raitas do people make and love to savour? The basic raitas are often made with vegetables, they can be either raw or cooked. Raita can also be made with fruits, or with the amalgamation of fruits and vegetables. Then there is also besan aka gram flour which works as the key ingredient. An example is this boondi raita where deep-fried gram flour puffs/balls are added to the yogurt. Then there is Fruity Veggie Booni Ka Raita raita where fruits and veggies are added along with deep fried gram flour puffs aka boondi. Is it easy to create tailor-made raita? Yes, it is very easy. Raitas can be made into wide varieties and one can be really playful when creating customized raitas. For raita flavors, the sky’s the limit when it comes to innovation. You can be ingenious to create personalized custom-made raitas. What is the role of raita in an Indian diet? 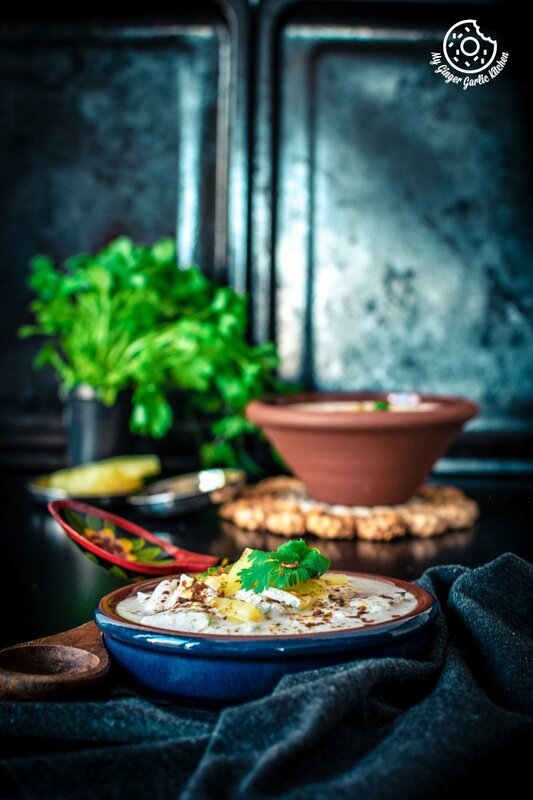 Raita is an essential part of any Indian meal, because it has all the soothing ingredients to balance the spicy Indian food such as curries and lentils. What is the most famous raita? All the different variety of raitas have their own significant number of admirers. But if you want me to name only one popular raita then this would be ‘Boondi Ka Raita’. 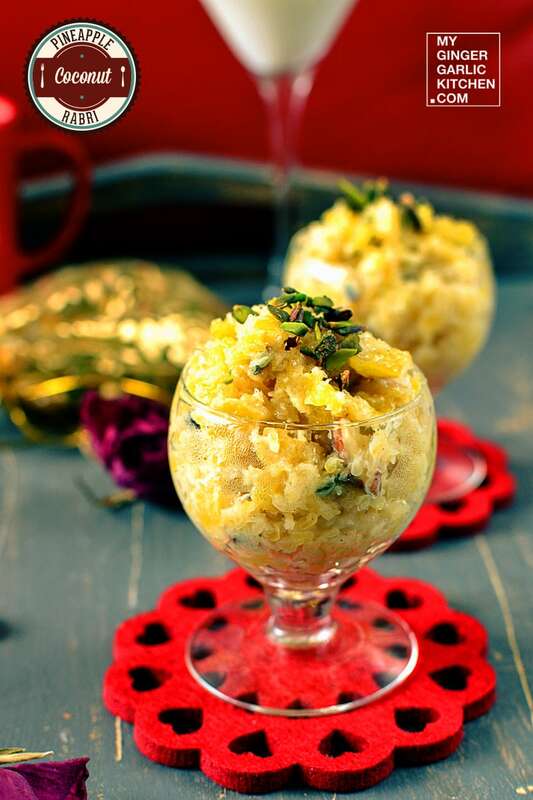 Be it a wedding, celebrations or festivals, this raita has witnessed them all and has been adored by every age group. Does raita also have some health benefits? Raita is a dish made of dahi/ yogurt. 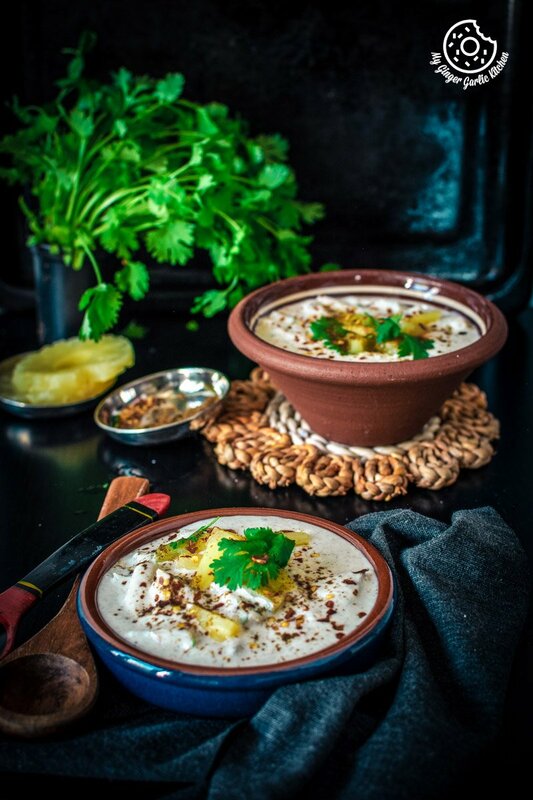 Dahi is known best for its cooling effect, especially on a hot summer day. 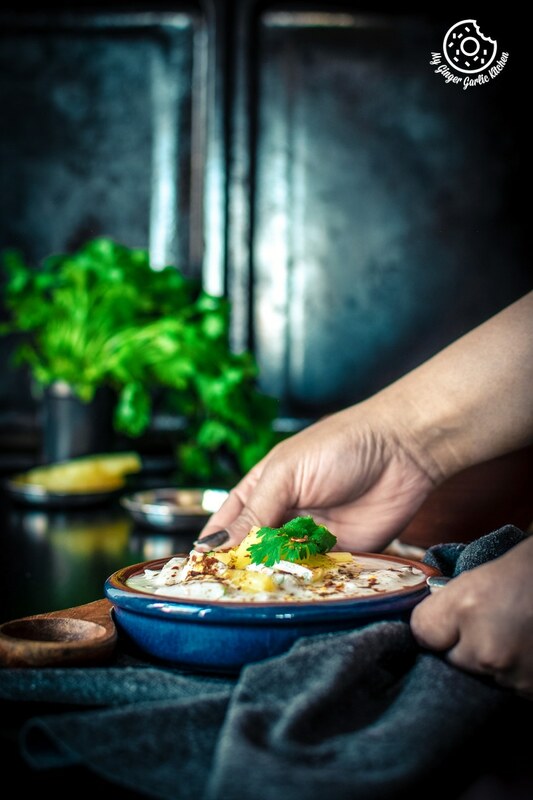 When we add essential spices to dahi such as roasted cumin powder, then it not only gives a perfect contrast to your spicy side dishes and adds a nice fragrance, but it also improves the digestion. This yogurt-based side dish raita is very light and good on the stomach. Plus, raitas can be served anytime. Additionally, curd contains healthy bacteria, thus raitas can carry them to your gut in the most desired tasty way. Sometimes the fresh pineapple gives unwanted tartness to the pineapple raita, so I usually prefer using canned pineapple for this recipe, but you can use fresh pineapple as well. I have added some sugar to add sweetness to this raita. If you don’t want it sweet then you can skip it. Or if you want to healthified it, then you can replace white sugar with honey. I used natural low-fat yogurt for making this raita, you can also use full cream raita for this recipe. Always use fresh dahi/curd which is not too sour. Use chilled pineapple and chilled yogurt for making this raita. I have added some red chili flakes to this raita, but you can completely omit this if this is too hot for your taste buds. I have added some chopped coriander leaves for that herby punch, but you can surely use fresh mint for a better refreshing flavor. Some people also prefer adding green chilies. If you like green chilies then feel free to add it. Do we need many ingredients for making this pineapple raita? No, you don’t need many ingredients for making this pineapple raita. This very simple and delightful pineapple raita can quickly be made with a very few ingredients. These vital ingredients are plain yogurt, pineapple chunks, coriander leaves, black salt (kala namak), sugar, roasted cumin powder (bhuna jeera powder), black pepper powder (kali mirch powder), chaat masala, and chili flakes. 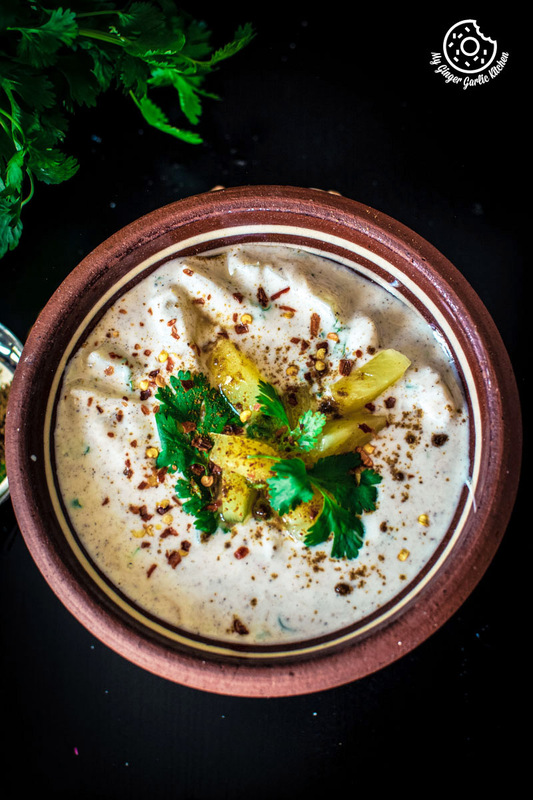 Pineapple raita aka ananas raita is a sweet, spicy and tangy raita bursting with juicy pineapples and seasoned with few spices and herbs. 1. Add chopped pineapple chunks, chopped coriander leaves, yogurt, black salt, cumin powder, chaat masala, sugar, black pepper powder, and chili flakes to a mixing bowl. 2. Whisk well to combine. 3. Transfer raita into a serving bowl. 4. Garnish with chopped pineapple chunks and coriander leaves. 5. Sprinkle with some cumin powder, and serve immediately with hot stuffed paratha or biryani or refrigerate.